Heirlooms worth £700,000, including a diamond tiara and a ring given by Charles II to his mistress, have been stolen from a West Sussex stately home. More than 40 diamond, sapphire and emerald items were stolen during a break-in at Goodwood House, near Chichester, on Wednesday. Sussex Police said many of the heirlooms belonging to Lord and Lady March were irreplaceable. A 26-year-old man from Hampshire has been arrested and is in custody. "The theft of these beautiful and treasured items have left the victims Lord and Lady March devastated," said Det Insp Till Sanderson. "We are doing all we can try to trace the stolen treasures - liaising with auction houses, stately homes, dealers and those with specialist knowledge. "Forensic teams are working with detectives to investigate the circumstances." 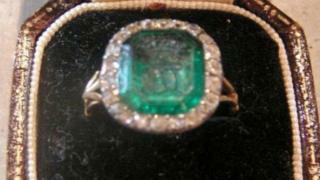 Officers have appealed to anyone who can help trace the stolen items to come forward. The also want to speak to anyone who saw any suspicious activity before 07:00 GMT on Wednesday or in the previous days.